Explore the best of the Bay Area's natural surroundings with a trip to two of the most popular attractions. 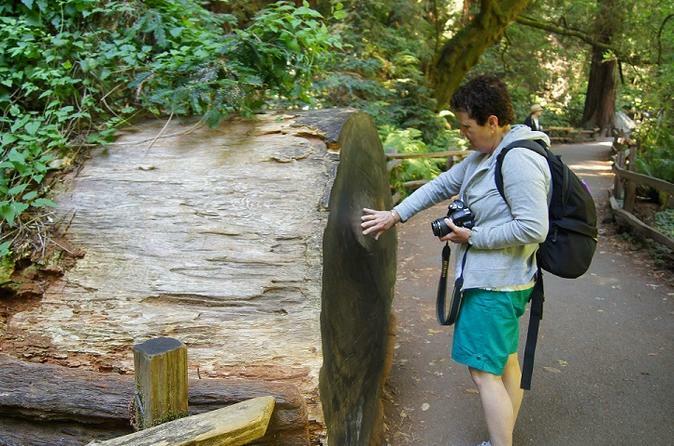 You will experience California's coastal redwood forest during your trip to Muir Woods National Monument. Then, take a drive through the quaint seaside village of Sausalito. At your leisure, visit the Aquarium of the Bay and marvel at the marine life larking below the San Francisco Bay waters. This five hour tour offers three convenient departure times to best suit your schedule! Following your visit to California's famous coastal redwoods, enjoy a visit to the Aquarium of the Bay to experience the local marine life beneath San Francisco. The Aquarium of the Bay at Pier 39 focuses on restoring the the local habitat of San Francisco and her marine life. Experience the awe and wonder of the Aquarium's jellies habitat, featuring Moon Jellies and Pacific Sea Nettles. Continuing on, in the crystal aqua tunnel you'll see a dynamic near-shore habitat that includes swirling schools of Anchovies, giant Sea Bass and colorful Sea Stars; and explore the deeper waters of San Francisco Bay in the second crystal clear tunnel habitat. This day trip will surely give you the best experience of San Francisco Bay's wildlife and marine culture!